Lynn Nottage's prize winner about tough times in a factory town tells a familiar story. Liz Zweifler, Danielle Lee Greaves, Carolyn Ann Hoerdemann and Matt DeCaro in Asolo Rep's Sweat. Factories closing, layoffs and lockouts, prescription drug misuse, hard times in the heartland—these may sound like today’s headlines. 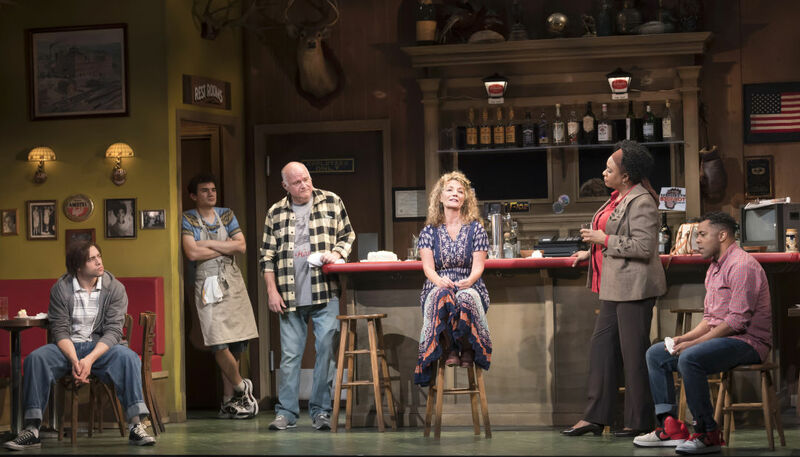 But in Lynn Nottage’s Pulitzer Prize-winning Sweat, now onstage in an Asolo Rep production, the dates of disaster are between 2000 and 2008, and the setting is very specific: the town of Reading, Pennsylvania. That’s where Nottage did her research, talking with plant employees and ex-employees who, after years of demanding physical labor, found themselves being shut out of the American dream their parents and grandparents may have enjoyed. 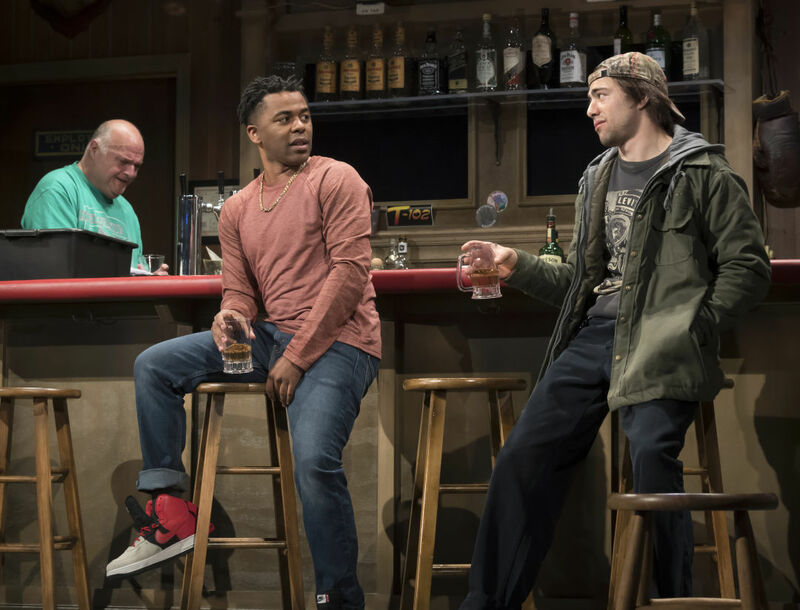 You can’t talk about those subjects without also touching on immigration and racism, it seems, so Nottage’s play introduces those elements to us, too. But, at least in this production, the battle lines, and to some extent the characters, can feel too obviously and predictably drawn, making the people we should be connecting with mouthpieces for what the playwright wants to convey. The cast, under the direction of Nicole A. Watson, works hard and with passion, but I wish I identified with their portrayals more. Sweat takes place mostly within a working-class bar, where floor workers Tracey (Carolyn Ann Hoerdemann), Jessie (Liz Zweifler) and Cynthia (Danielle Lee Greaves) come to blow off steam and to celebrate special events like their birthdays. It’s never made any difference that Cynthia is African-American and Jessie and Tracey are white; they’re united in their struggles to survive and make life better for their families. In the case of Cynthia and Tracey, those families include their sons, Chris (Kevin Minor) and Jason (Matthew Kresch), whom we first meet separately in 2008 after their release from prison for a crime we don’t learn the details of until much later. Tracey’s a widow, but Cynthia’s husband, Brucie (Bruce A. Young), is a veteran of the union line, holding out month after month for a decent contract and paying a heavy price for doing so. 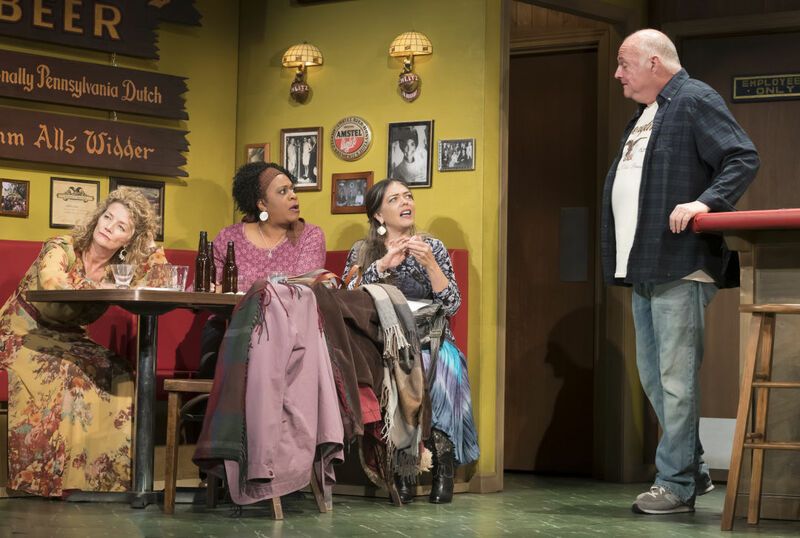 Their friendly neighborhood bartender, Stan (Matt DeCaro, in a welcome performance of a role that differs from some of the more blustery ones he’s played at Asolo Rep), plays peacemaker amid strife when competition for a promotion at the factory turns Tracey and Cynthia against each other. But even he can’t do much to keep tension from exploding when the bar’s Hispanic dishwasher, Oscar (Rudy Galvan), tries to take his shot at that American dream by working as a scab. As we toggle back and forth in time from 2000 to 2008, television and newspaper headlines and voices like Bill Clinton, George W. Bush and Barack Obama remind us of what was going on then, politically and economically. It’s recent history, but sometimes we forget all too quickly; the headlines alternate between being helpful and being intrusive. Young actors Kresch, Minor and Galvan are convincing and, to my mind, more touching than their older costars. But Hoerdemann, Greaves and Young all have moments where their plight becomes real to us. I just wish that our empathy for them were more consistent throughout. Sweat continues in rotating rep through April 13; for tickets call 351-8000 or go to asolorep.org.